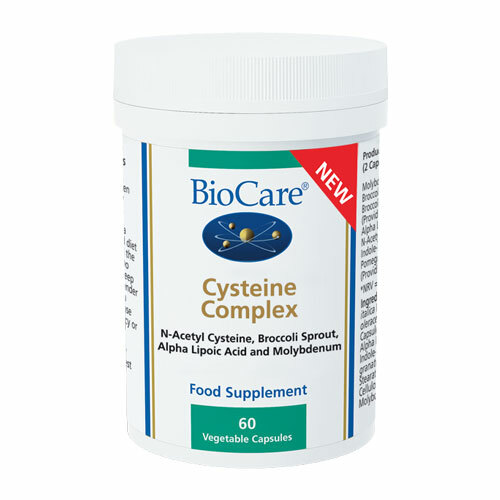 Cysteine Complex is a specialist combination of n-acetyl cysteine, alpha lipoic acid, pomegranate extract, broccoli extracts, indole-3-carbinol and molybdenum. Molybdenum supports sulphite metabolism and plays a vital role in energy and iron metabolism. It supports detoxification, mucus breakdown and uric acid metabolism. Broccoli and broccoli sprouts are a source of micronutrients and plant chemicals, including sulphoraphanes, glucoraphanins and diindolemethane (DIM). Pomegranate is a rich source of polyphenols, including ellagic acid. Broccoli Powder (Brassica oleracea italica Florets), Broccoli Sprout Powder (Brassica oleracea italica), Bulking Agent (Cellulose), Capsule Shell (Hydroxypropyl Methylcellulose), Alpha Lipoic Acid, N-Acetyl L-Cysteine, Indole-3-Carbinol, Pomegranate Extract (Punica granatum Hulls), Anti-Caking Agents (Magnesium Stearate & Silicon Dioxide), Microcrystalline Cellulose, Sunflower Lecithin, Potassium Molybdate. One or two capsules taken daily with food, or as professionally directed. 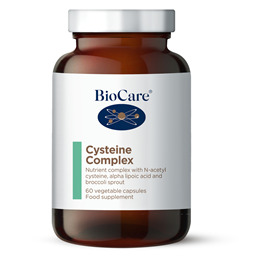 Below are reviews of Cysteine Complex - 60 Capsules by bodykind customers. If you have tried this product we'd love to hear what you think so please leave a review.